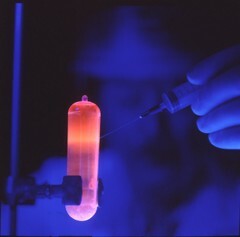 A purified DNA, fluorescing orange under UV light, being extracted with a syringe and used for molecular biology studies. The purified DNA, in a cesium chloride gradient, binds to the ethidium bromide dye which absorbs UV light and makes the DNA fluoresce orange. This visualization of a single band of DNA aids in the isolation and extraction of the DNA for future molecular biology studies. Dr. Bruce Chassey Laboratory. National Institute Of Dental Research. Li-shan.